Yet another success from Cook's Illustrated, these glazed chicken breasts are fantastic. I love glazing pork tenderloin and chicken; I just feel like it gives it so much flavor, and I love the crust that forms from the glaze. I adapted this recipe a little by using boness-skinless chicken breasts... you know, to keep them a little healthy. i made a few other minor changes as well, which are reflected below. It was a perfect fall Sunday supper with sauteed kale and Trader Joe's harvest grains. One final note, I highly recommend using a meat thermometer for this recipe. The cook time will vary depending on several factors - the thickness of the chicken breast, how long you cook it on the stove-top, and the heat of your pan. There will be no question of the doneness if you simply use a thermometer. I use mine almost every time I cook chicken and pork! Adjust oven rack to the middle position and heat to 375. Whisk together 1 1/2 cups apple cider, corn syrup, maple syrup, mustard, vinegar, 1/8 teaspoon each of salt and pepper, and red pepper flakes together in a medium bowl. Spread flour in a shallow bowl or pie plate, and season chicken breasts with salt and pepper. Dredge each chicken breast in flour, patting off excess. Heat oil in an oven-proof 12-inch skillet until it is shimmering but not smoking. 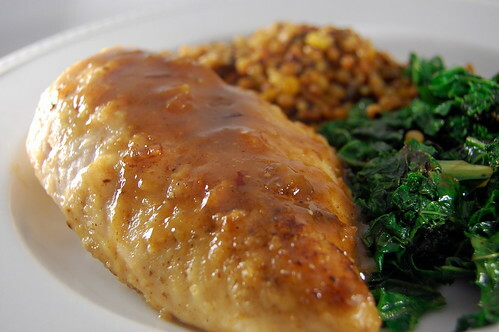 Lay chicken breasts in a single layer, and cook 12-14 minutes, turning once, until both sides are golden brown. Transfer chicken to a plate. Pour off all but 1 teaspoon of fat. Saute shallot until softened, about 1-2 minutes. Increase heat to high, and add cider mixture to skillet. Simmer, stirring occasionally, until mixture has reduced to about 1 cup, 6-10 minutes. A spatula should leave a slight trail when dragged through the mixture. Remove skillet from heat, and tilt so that all the glaze pools on one side. Use tongs to coat each chicken breast in the glaze, and lay in a single layer in the skillet. Transfer the skillet to the oven and bake until the thickest portion of the chicken reads 160 on an instant read thermometer, 20-25 minutes, turning chicken halfway through. Remove from oven and set the chicken aside. Return the skillet to high heat on the stove top (be careful, the handle will be very hot!!). Cook until glaze has thickened and is syrupy, about 1 minute (a spatula will leave a wide trail when dragged through). Remove from heat and whisk in remaining 2 Tablespoons of cider. MMM...maple and cider combined must be a great glazing combo....nice!